Interested in serving on your State Board of DanceSport? DanceSport State Board Elections are being held this year from September to November. If you are considering standing for the State Board then this article is for you. We outline what a State Board does and what this means for you if you are successful. The State Board is the glue that holds the DanceSport industry together within the State. Plus a strong work ethic. Do you have those attributes? Serving as a Director on a State Board can be one of the most rewarding experiences of your DanceSport career. If serving DanceSport in your State in this way seems attractive, we encourage you to think seriously about standing for election at the upcoming State AGM. 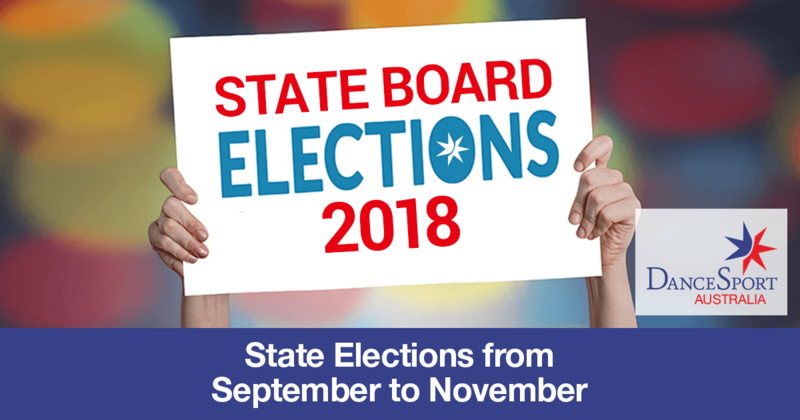 Full details of how to go about nominating for a role on your State Board will be published in the August 2018 edition of 'Focus', coming to you soon. More information can be sought from your State Branch Chairperson or Executive Officer – contact details are on the DSA website. Interested in serving on a State Board of DanceSport?